Robert Stuberg specializes in packaging knowledge and ideas, and bringing that information to the broadest possible marketplace. He provides high-end consulting to individuals and organizations seeking to expand the reach of their message through books, audio programs, video programs, software, radio, TV, and the Internet. Robert Stuberg will assist you in all aspects of publishing, from initial conception to finished product, from marketing to international distribution. He is the creator of The Strategic Publishing ProcessTM which is designed to amplify your message so that it will reach the widest possible audience. This comprehensive publishing method has been used for decades to produce thousands of successful publishing projects. Now is the time for you to share your wisdom with the world! You’ve developed enormous expertise and insights through your personal and professional experiences. Now is the time to bring that wisdom to the world. Sharing what you’ve learned and experienced is one of the most exciting, powerful, and profitable things you will ever do. 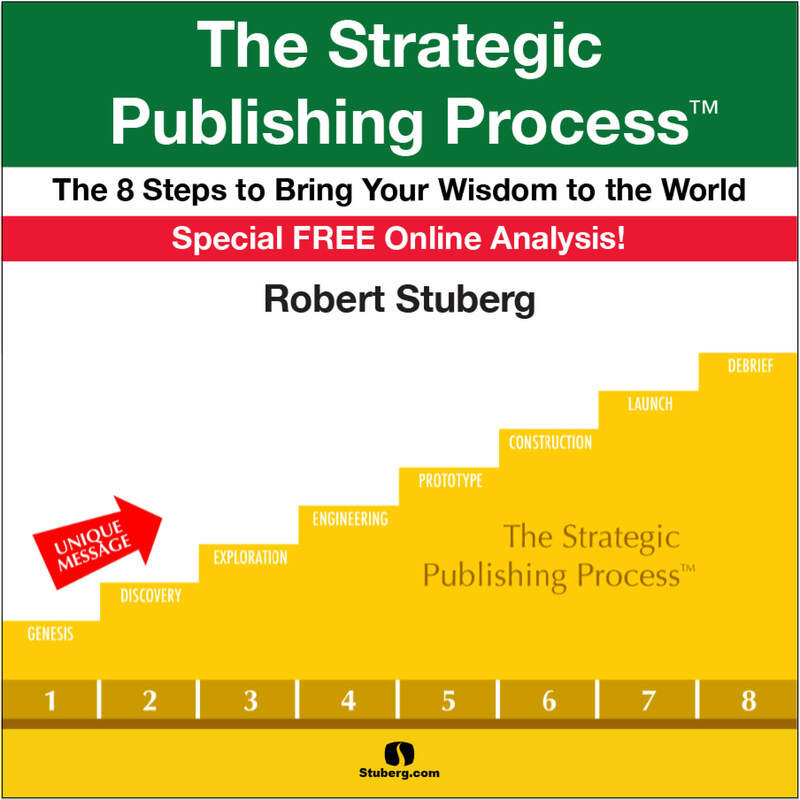 The Strategic Publishing ProcessTM is a trademarked analysis and strategy process designed by Robert Stuberg to assist authors and organizations with the development of their publishing projects. Robert is one of the most widely respected publishing executives in the world. After more than a decade at Nightingale-Conant Corporation, Robert left his position as Executive Vice President to pursue his own business endeavors including the creation of this unique and powerful publishing process. Sign up for a FREE Online Analysis of your publishing project. Robert Stuberg works personally with a handful of publishing clients each year to develop their ideas and create new books, audios, videos, and other publishing works. Sign up for a FREE Online Analysis today! Take a closer look at The Strategic Publishing ProcessTM listed below. This unique process is designed to guarantee the success of your project. The Genesis Stage is the starting point for your publishing journey. After completing this phase you will clearly understand how you can use publishing to expand your reach in the world. You will receive a Situation Analysis that will steer you in the right direction. – Is there a big idea or compelling concept to act upon? – Is publishing the right and/or best action based on the client’s needs? – Is there a thorough understanding of what it takes to publish a product? – What is the primary reason why the client is seeking to publish? – What are the key deliverables and essential outcomes from the project? – What are the client’s expectations about the publishing process? – What would have to happen for the project to exceed the client’s expectations? The Discovery Stage will allow you to begin answering the essential questions that will determine your publishing success. After completing this phase, you will possess a new level of clarity regarding your project and essential outcomes. You will receive a Publishing Proposal that will allow you to see how your wisdom will be developed. – What are the client’s Strengths, Weaknesses, Opportunities, and Threats (SWOT) personally and professionally? – Who is the author and what are his or her credentials? – What makes the author uniquely qualified to present the topic? – What are the best uses of a new product and what kind of product would provide the greatest benefit for the client? – What kind of product with what kind of positioning will achieve the client’s outcomes? The Exploration Stage will give you concise overview of your product from start to finish. After completing this phase, you will have an outline of your finished product along with a sample of the actual product. You will receive a Publishing Plan that will crystallize your product in great detail and bring total focus to your publishing mission. – What is the Ideavirus™ or Unique Marketing Proposition™ the product is based upon? – What will make the product unique or special compared to other products already on the market? – Who is the exact target audience and how will they be impacted, changed, or influenced by the product? – What is the most elegant way to create the product and achieve the client’s outcomes while enjoying the process? The Engineering Stage will give you an analysis of the costs and timeframe for your product. After completing this phase, you will know exactly what your product will require from a budgeting standpoint as well as a timeframe for completion. You will receive a Publishing Budget that will allow you to move forward with complete confidence. – What resources are needed to create the product — i.e., editing, ghostwriting, graphic design, etc.? – Who is going to complete the various components to the product? – What systems and procedures will be used to create the product and manage the process? – What is the timeframe for product development? – What are the prices for each product component? – What is the overall budget estimate? The Prototype Stage will give you a model of what the final product will look like in form and function. After completing this phase, you will be able to see and touch a draft version of your finished product. You will receive a Product Proof that represents the finished product. – How can the product be created in a way that all of the client’s outcomes are realized within the established budget? – What kind of draft version of the product will best serve to illustrate the final product to the client? – When will the draft version of the product be available for client inspection and review? – Are there any final revisions that are required to make the product even better and/or exceed client expectations? The Construction Stage will take you through the steps necessary to manufacture your product. After completing this phase, you will have the final product ready to sell to end users or to the various distribution channels. You will be ready to begin distribution in the marketplace. – How many products are needed to serve the initial market demand and have any changes happened that affect the established budget? – What vendors are best suited to manufacture this specific product–i.e., printers, binders, assemblers, etc.? – What vendors will best meet the established price, quality, and delivery requirements? – Are the quality requirements for manufacturing being met? – Are delivery times being met? The Launch Stage will provide you with a focused plan for distribution. After completing this phase, you will know exactly how your product will be distributed, and you will have clearly defined distribution opportunities. You will receive a Distribution Plan that covers all aspects of getting your books into the hands of your target audience. – Which distribution sources are best suited for the product? – What is the best way to move the product into the appropriate distribution channels? – What systems need to be utilized in order to maximize product distribution? – What needs to be communicated to each distribution source to maximize product exposure in the target marketplace? The Debrief Stage will allow you to look back over your success and consider your next steps. After completing this phase, you will have a heightened sense of confidence regarding your publishing abilities. You will receive a Project Assessment that will provide you with a plan for your next best steps in the world of publishing. – What is the overall assessment of the project? – Were the client’s outcomes achieved? – Is the client a “raving fan” of our services? – What are the appropriate next steps to take? – When would be the right time to continue on with the publishing process by launching another project? – What would be the best next project to begin discussing? Start Creating Unique Message Today! If you’ve ever considered creating a book, audio program, or video program, sign up for a FREE Online Analysis today! Robert Stuberg can also help you develop materials for software, radio, TV, and the Internet. 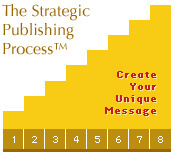 It all starts with using The Strategic Publishing ProcessTM to create your unique message! Robert’s experience comes from working personally with this generation’s best-known and most successful authors. Robert has worked personally with the best of the best, from Tony Robbins to Stephen Covey, from Deepak Chopra to Ken Blanchard. Robert has brought his years of experience to the publishing industry with an unmatched ability to help you create your unique message and distribute it to the world. “I wanted to let you know how much I am enjoying working with you on my book project. Your Strategic Publishing Process is exactly what I have needed to get my thoughts organized and finally complete my book. I can’t tell you how pleased I am with your guidance and coaching. I can now see why you were so highly recommended to me as someone with unique insight and total mastery in the areas of product production, marketing, publishing, and distribution. You are helping me to share my ideas with the world, and I greatly appreciate your contributions to my life. — James F. Thomas, Jr.
“I attended a very helpful publishing workshop you held in the Chicago area last October. I am writing to let you know that, finally, my book is out. The name of the book is called ‘The CEO Challenge: A New Paradigm for Delivering Sustainable Results’. “Thanks for an unbelievably powerful coaching session. You just helped me take my idea to write a book and bring it up to an outline in much less than an hour. Now I’ve magically leapfrogged from thinking about the book to actually being deep into completing it. — Richard G. Petty, M.D.